Yeah, I’m too lazy to give it a snappy subtitle. SPRINGFIELD, ILL. (AP) — Gov. J.B. Pritzker’s administration is pleased with the findings of a peer-reviewed study of a graduated income tax despite its conclusion that it would raise less revenue than the Democrat predicts. The study released Monday by the Illinois Economic Policy Institute and the Project for Middle Class Renewal reviewed various scenarios for a system requiring the wealthy to pay more. Illinois has a 4.95% flat rate. Researchers determined that Pritzker’s proposal would raise $3.1 billion more annually. Pritzker estimates $3.4 billion . Pritzker spokeswoman Emily Bittner says the administration used more recent tax data not available at the time the study began. She says researchers based revenue on 2018 incomes. A tax-plan change would require voter approval in 2020 at the earliest. Pritzker’s assumption draws on expected higher incomes in 2021. 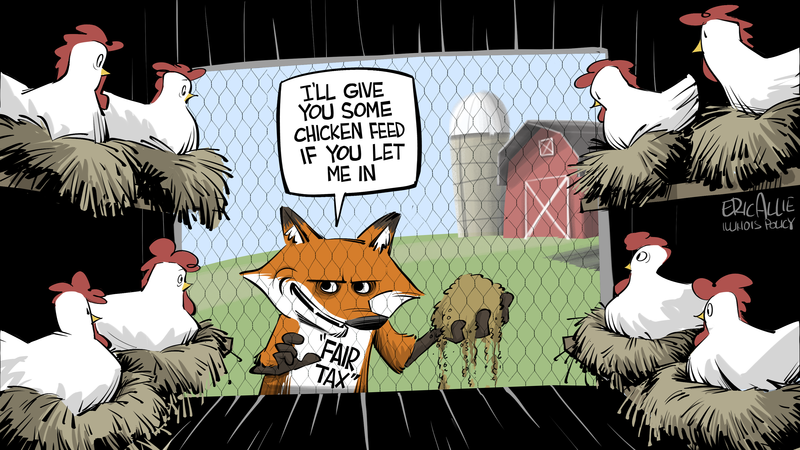 Pritzker’s “Fair Tax” isn’t a real plan. 1. Ordinary Illinoisans will have no say over the actual progressive tax rates. 2. Taxing only the rich won’t work. The middle class will get hit, too. 3. Many progressive tax states hit middle class individuals harder than Illinois does now – and that’s before Pritzker’s promised spending kicks in. With the November 2020 election 19 months away, it’s way too early to hit the campaign trail. But don’t tell that to the proponents and opponents of Gov. J.B. Pritzker’s proposed progressive-tax amendment to the Illinois Constitution. On an issue where perception is reality, both sides are working hard to shape voter attitudes in a way that will produce their version of victory at the ballot box. Gov. Pritzker and his allies are pushing the theme that his plan to replace the state constitution’s mandated flat tax with progressive rates on higher levels of income will “solve” the state’s financial problems. Polls show that relatively few state voters are aware of the Pritzker plan. Apparently, they’re all hiding under a rock in some alternative universe where news does not enter. But those who are watching surely have noticed a constant theme undergirding the progressive tax plan — millionaires bad, non-millionaires good, get the millionaires. Pritzker’s press office recently released income data from nearly 20 counties showing that the governor’s proposal raises taxes on even fewer taxpayers there than the estimated 3 percent statewide. The term “millionaires” in this context is a misnomer because the progressive tax applies to income. Pritzker’s increase would affect those with incomes substantially less than $1 million a year. One version of the rates Pritzker said he would like to put in place — if the amendment passes — would raise tax rates on those who earn more than $250,000 a year. That group could include those with annual incomes of $1 million or more a year, those with total assets in excess of $1 million a year or even individuals who enjoy one-year income bonanzas that exceed $250,000 but have not, in other respects, achieved millionaire status. The Illinois House and Senate must vote with 60 percent majorities to put the amendment up on the ballot. To become law, voters must then pass it with a 60-plus percent super-majority. An IPI pollster — Fabrizio, Lee & Associates — surveyed opinions in the House district of Decatur state Rep. Sue Scherer. It found mixed support for Pritzker (31 percent favorable, 28 percent unfavorable), opposition to the proposed amendment (41 percent opposed, 32 percent for). It produced similar negative results in four other state House districts held by Democrats. I would like to believe that Illinois voters know that any progressive tax will eventually be used to dip down and to hit them harder. To make up for all the underpayment for pensions (and other operational costs) over decades. Because there aren’t enough rich people. Governor J. B. Pritzker should seek the advice of Andrew Cuomo in New York. Last month, New York governor Andrew Cuomo and Illinois governor J. B. Pritzker stood together to blame the 2017 federal tax cuts for the flight of high earners and middle-class families from their states. But just days before, Cuomo admitted he knows something Pritzker seemingly doesn’t: They’re leaving to escape painful progressive state income taxes. Cuomo said New York took a $2.3 billion hit in income-tax revenues. He panned any new tax on millionaires. But that message isn’t getting through to Illinois, where Pritzker wants to mirror the failed tax structure in New York by replacing Illinois’s constitutionally protected flat tax with a progressive income tax. Such a move would be disastrous for Illinois’s economy, forcing middle-class families and high earners, as well as job creators, to leave at an even faster pace. And it wouldn’t ultimately solve the state’s serious fiscal crises or even raise the $3.4 billion Pritzker promises. After delaying a Freedom of Information Act request for the governor’s tax-hike math, his office finally sent a brief response filled with overly optimistic assumptions. They got the number wrong for the past five years of Illinois’s economic growth. Then, starting too high, they failed to correct for the economic slowdown or recession most economists predict will hit by 2021. Perhaps Cuomo should tell Pritzker what happens when you shoot with a bent sight. Illinois lost more than 45,000 residents last year; only New York lost more. That is Illinois’s fifth consecutive year of worsening outmigration. Illinois’s change in population since 2014 is in raw terms worse than that of any state in the nation — 157,000 people are just gone. “Taxing the rich” always encourages the rich to leave. And tax hikes never end simply with the highest earners; working families always end up paying more, too. Yes, the rich people have the money to move. And you can’t claw their money away when they leave. Regular readers of my Taxing Tuesday know that not only am I a fan of the SALT cap, I want that cap to be zero. That said, there are ways people get around that SALT cap — ways to reduce one’s state taxes. WSJ: The Muni-Bond Mania — Look who’s benefiting from the limit on state-and-local tax deduction. Democratic politicians in the states love to blame the GOP tax reform for blowing holes in their budgets even as they quietly benefit from the new limitation on state-and-local tax deductions. Lo, investors seeking to reduce their tax liability are gobbling up municipal bonds, driving down yields and reducing government borrowing costs. Municipal bond funds are experiencing near-record inflows. More money poured into muni funds during the first eight weeks of this year than during the same period since at least 2006. No longer able to deduct most of their state-and-local taxes on their federal returns, investors are seeking alternative vehicles that offer protection from the tax man. Democrats can’t be blamed for trying to take advantage of the muni-bond mania. Illinois Gov. J.B. Pritzker has proposed selling $2 billion in bonds (which would be taxable) to inject into the state’s insolvent pension funds that are only 40% funded. The idea is the state can borrow at a rate of around 5% and then earn 7% on pension-fund investments. Sweet. But the state has already borrowed more than $17 billion to prop up its pension funds, and the interest-rate arbitrage transfers risk from state taxpayers and workers to investors. Recall that investors in Puerto Rico, Detroit and Stockton, Calif., were eventually burned by similar schemes. Told you POBs were of the devil. ATTOM Data Solutions released its 2018 property tax analysis for more than 87 million homes, announcing that single-family homeowners last year paid a total of $304.6 billion, up from $293.4 billion in 2017. The average was $3,498 per home, according to the report , which made for an effective tax rate of 1.16 percent. Westchester led the way, with an average property tax bill on a single-family home of $17,392, highest in the nation, the report stated. Rockland had the second highest tax bill in the country, with an average property tax bill of $12,925. In the Hudson Valley, homeowners in Putnam have an average property tax bill of $9,725, followed by Orange County at $7,745 and Dutchess County at $6,959. Okay, I’ve never had a tax bill anywhere near that high, but then, I’m in a “small house” for my area. I live near million-dollar homes. Mine definitely isn’t one of them. My luxury is living in New York, though. There can be a time when I no longer can afford this lavish lifestyle of used minivans and keeping ducks. Brookings: The Filer Voter experiment: How effective is voter registration at tax time? The Atlantic: Filing Your Taxes Is an Expensive Time Sink. That’s Not an Accident. They really can’t, unless they can figure out how to cut past promises. They’re not willing to do that, so bills must be paid. There are so many problems with that idea. Does this mean we can deduct unrealized losses. Today's stupidest maneuver: MAGA dudes rolling up and declaring that if we're allowed to see Trump's taxes we should see Democratic politicians' taxes too. I mean, that's fine with me; did they expect me to go, like "Horrors! Heavens no!"? Nothing stopping you from sending more money to the feds, dude. Go for it! Self-Driving Cars: Won't Anybody Think of the Poor Revenue-Hungry Governments?